Dental veneers are one of the most popular cosmetic dental options available. As the name suggests, it essentially comprises an ultra-thin laminate of tooth-coloured material that is applied to the surface of front teeth. Dental veneers offer a non-surgical, minimally invasive technique to make your smile look more bright, natural and healthy looking. If you are not completely satisfied with the appearance of your teeth and smile, dental veneers can deliver a fast and effective smile makeover with amazing results. 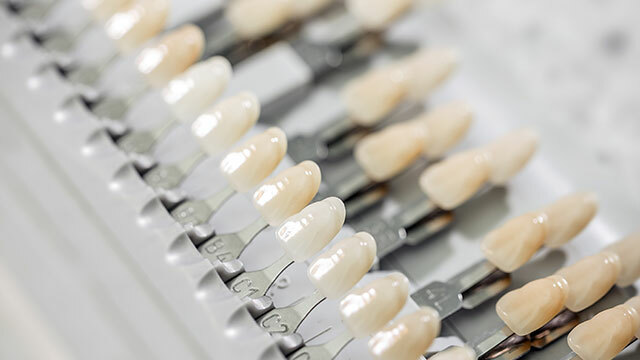 The simple veneering treatment, which usually requires around 2 – 3 dental appointments, is highly versatile being able to correct a wide variety of dental aesthetic issues including bite problems, crooked teeth and worn out teeth. Our dentists may recommend dental veneers if you wish to enhance certain aesthetic aspects of your teeth and smile. While the procedure can be performed very quickly and easily, the results can look very natural and aesthetic, especially if administered by our experienced dental team. However to be considered a good candidate for dental veneers, your teeth must generally be in good health. Any underlying dental problems such as tooth decay or gum disease must be addressed prior to the cosmetic procedure. In order for the veneers to be properly anchored, you should also have sufficient enamel, which is critical for a successful outcome. It can take months or even years for orthodontic braces to correct misalignment issues. If your primary concern with the misalignment lies with the aesthetics of your smile, dental veneers represent incredible time-savings and can be installed in as little as 2-3 dental appointments. Our team is here to help you. Please do not hesitate to ask any questions you may have about dental veneers. Simply fill out our contact form and we’ll contact you quickly to book your consultation. Or, if you’d prefer to talk, please call us on (08) 9328 5027.